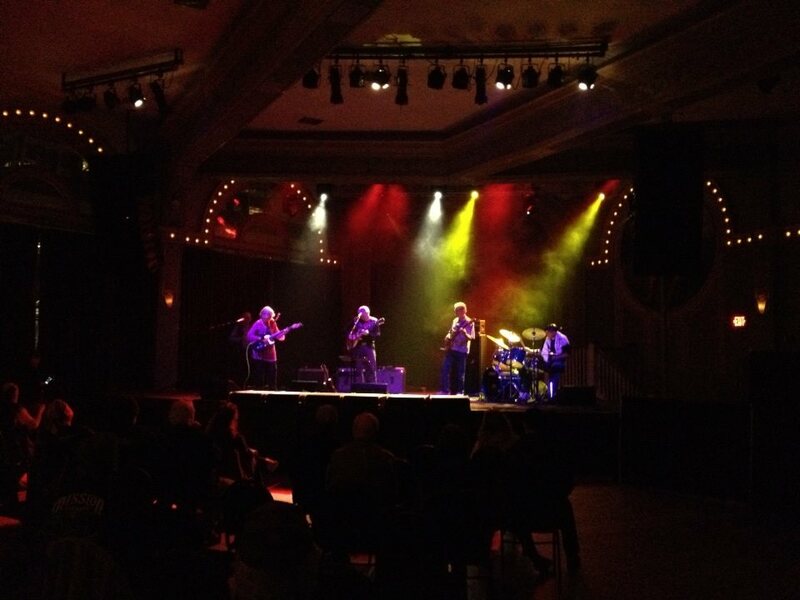 PZEB at the Crystal Ballroom in 2014! on a Monday night to hear them. The Portland Zoo loves its fans! Thank you U.S. Candenza - they rocked! PZEB at the Bagdad Theatre in 2013! 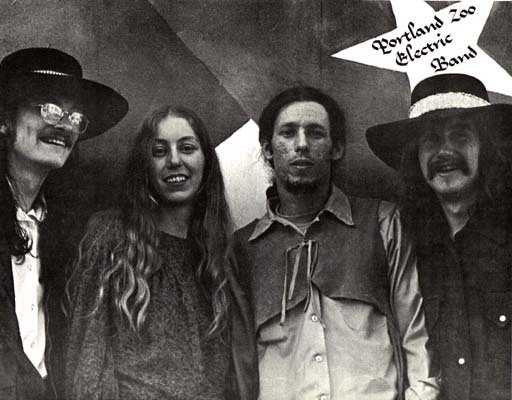 Monday, August 26th, 2013 at 7:00 p.m.
"Portland in the 1960s - Stories from the Counterculture"
based on the book by Polina Olsen. 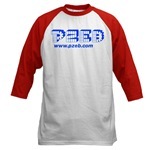 Monday, August 26th, 2013 at ~8:45 p.m.
PZEB on OPB in 2010! PZEB 40-year reunion in 2008! 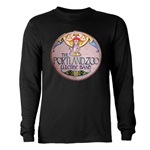 8:00 p.m. - The Portland Zoo! 9:30 p.m. - The Portland Zoo! Misc pictures from rehearsals, etc. 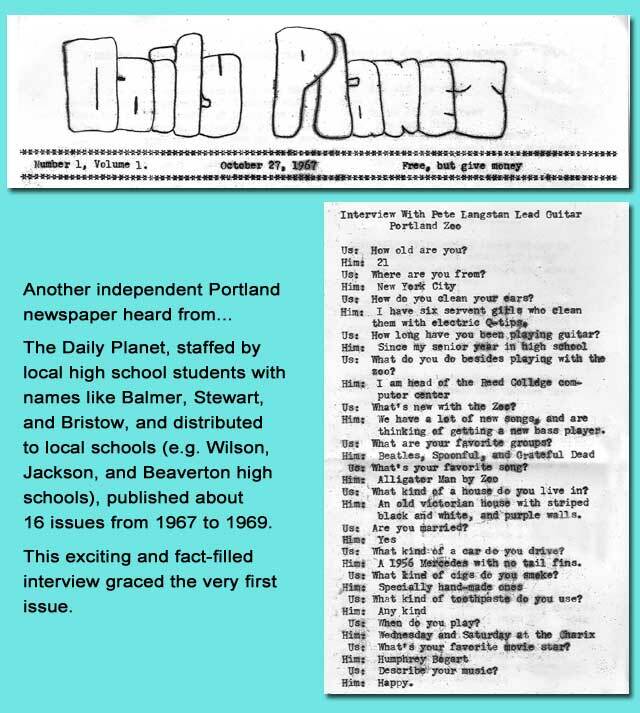 This is an article from 12/1/67 issue of the Vanguard, the Portland State College newspaper. 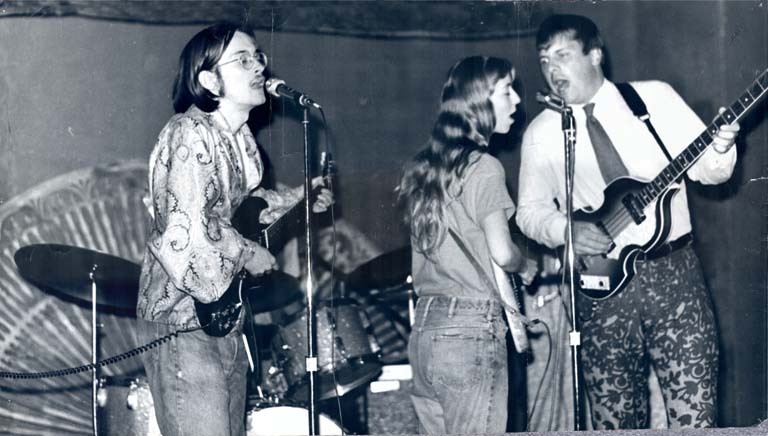 All the people pictured are identified except for those in the largest picture; it shows Peter singing, Sharyle playing guitar, and Fred Corbett's left hand fretting his Hofner "Beatle Bass." They had to crop Fred out of the picture because he was wearing his flowered pants. 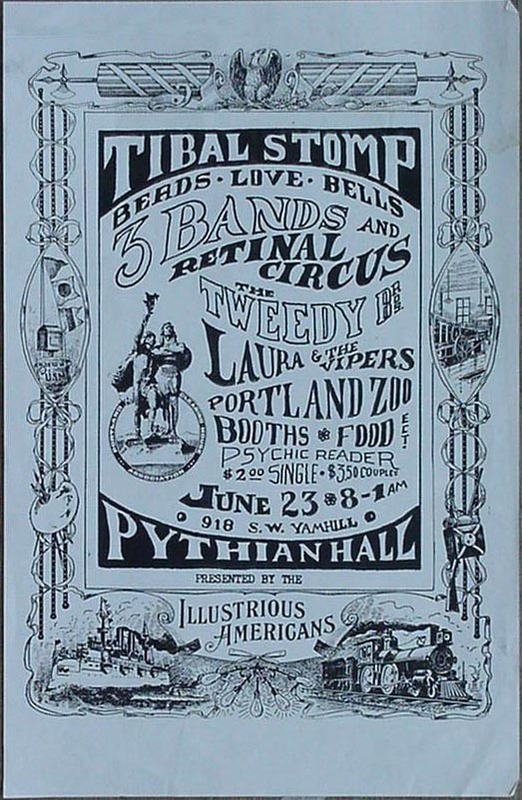 The Portland Zoo, world's most ethnic phantasyrock group, usually plays Wednesday and Saturday evenings at the Charix, basement coffeehouse of the Unitarian Church, 12th and Salmon Street. 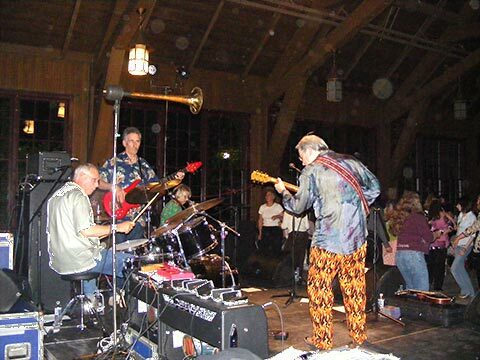 The Zoo is Peter Langston from Reed College, lead guitar; Sharyle Peronya Patton from PSC, rhythm guitar; Larry Whitney from Lewis and Clark, drums; Denny Jackson ex-PSC, bass guitar; and Triple Dwarf from the basement of the church, harmonica. 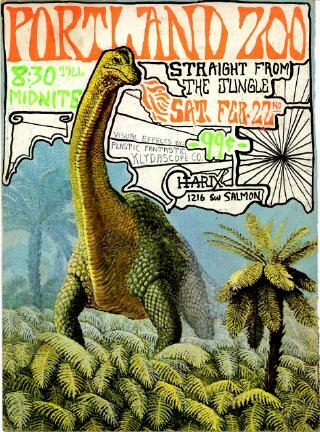 For the best rock music in Portland at the Charix it's only 50 cents weeknights, 75 cents weekends. Don't wait too long or you'll find yourself giving the KISN goodguys $2.50 per ticket to see the Zoo at the Memorial Coliseum. 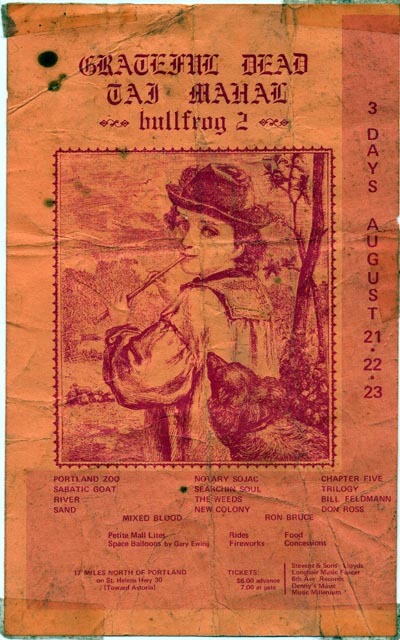 This is from an article in the 12/17/70 issue of the Willamette Bridge, a local underground paper. With the Fairgrounds unavailable for the festival, many of the would-be festival-goers descended on the St. Helens town square instead and had a pseudo-festival there. 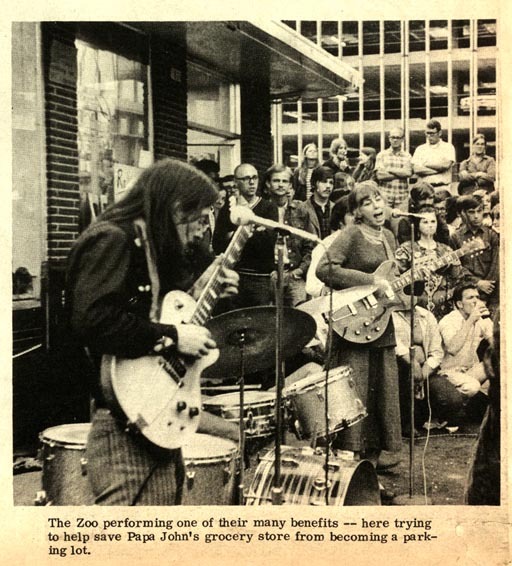 It was all very friendly and upbeat and the Zoo joined in and played there. 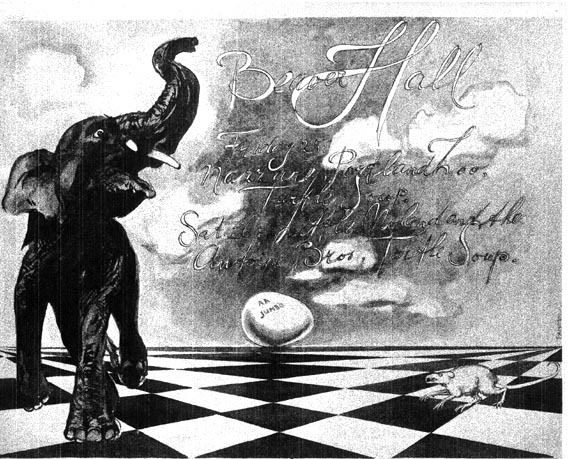 The St. Helen's newspaper, the Sentinel-Mist Chronicle, followed the events of Bullfrog 2 and 3; Click here to see a collection of articles. -- drawn by Kelly of Mouse Studios (San Francisco) and contested by lawyers of Disney Studios! I saw you guys play at the Art Pearl for Governor 12 Hours of Music Festival in the University of Oregon gymnasium in the spring of 1970. 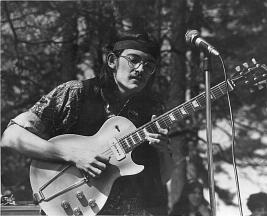 I thought that the lead guitar player was one of the best I had ever heard anywhere. I still remember one of the lead guitar riffs that was played. I also thought that it was really cool that you ended your show with a recording of a telephone operator saying over and over "At the tone, the time will be". What a great show!! 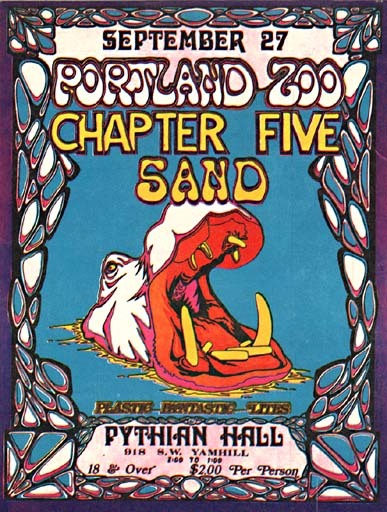 Another one of many colorful animal-themed Portland Zoo posters, this one from 1968 is for a dance at the Pythian Hall on Yamhill in downtown Portland, Ore.
"FREAK OUT TONIGHT AT THE PYTHIAN HALL! . . ."
and he recorded it, and then, 42 years later, shared it with us. CLICK HERE to play back the ad. Roxy had just changed its name to (or perhaps it was from) Roxy Music. 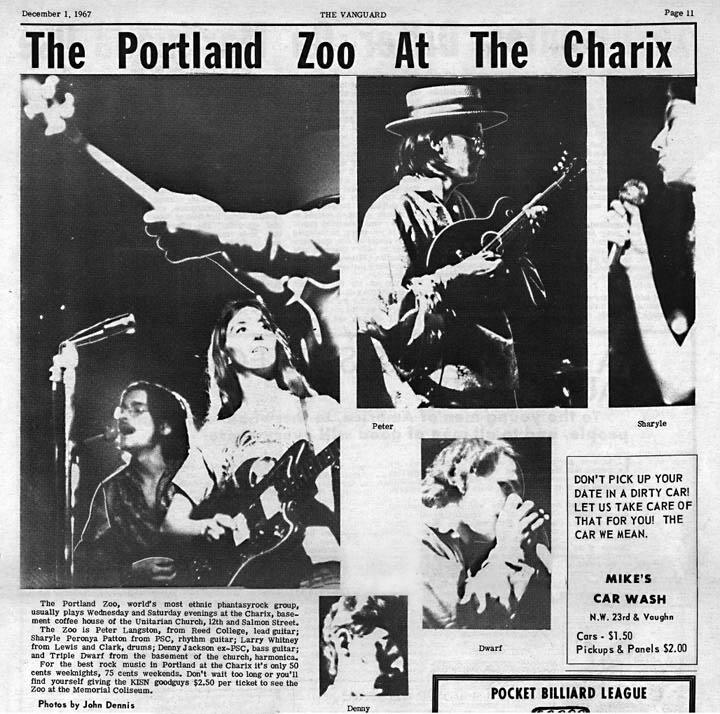 The Portland Zoo was just the kind of band that the folks at Zap Comix could understand. 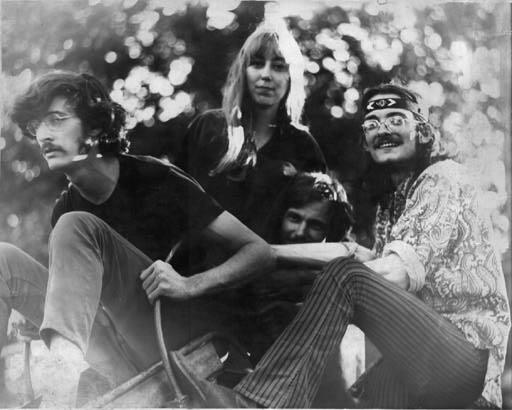 left to right: Denny Jackson, Bass · Sharyle Patton, Guitar · Pat Coffey, Drums · Peter Langston, Guitar The band takes a little break from rabble rousing in Lair Hill Park. We were protesting something that park commissioner Ivancie was doing... closing down the parks, maybe? So we threw him a party! Many of these posters are from the collection of Greg McCullough. (Thanks, Greg! ), a few come from Gary Ewing's collection (thanks, Gary! ), and the rest are from Peter Langston's basement. This is Peter with his favorite electric guitar, a specially customized and hot-rodded 1952 Gibson Les Paul with trapeze tailpiece that he bought from Stew Dodge of the U.S. Cadenza band. It was stolen along with all the band's equipment but was not recovered when we tracked the rest of the equipment to San Francisco. It seems the guitar had already been sold and shipped to someone in Vermont... Sigh! 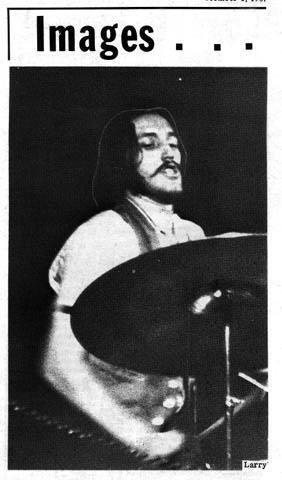 You can tell Peter was so "into" this solo that he didn't notice a caterpillar crawling onto his lip! One of a series of buttons drawn by Dutch artist Henk Pander for the Band. Each button represented one of us (this one is obviously Peter -- note his anatomically-correct hair-do). 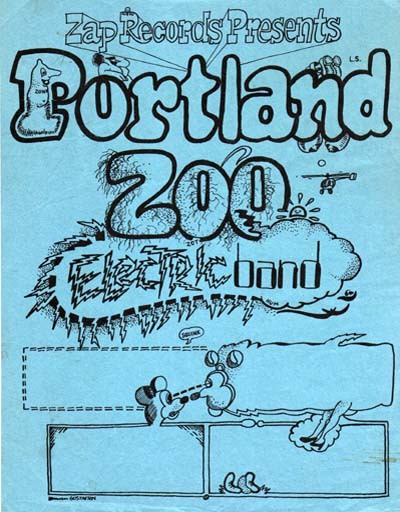 We gave these out at concerts and dances to highlight the important role of the audience in the band's music, thereby making everyone an honorary member of the Portland Zoo Electric Band. 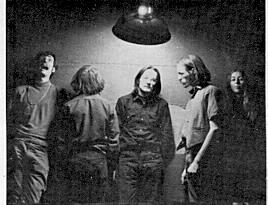 Sharyle and Peter were responsible for the bulk of the vocals, but everybody sang, at one time or another. I'm sure there are names missing from this list... If you know them please let us know! We're keeping an eye out for other bits and pieces left behind by the band. please let Peter know via e-mail. 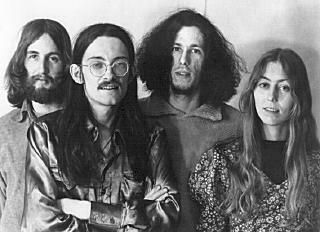 The Zoo recorded two songs in the studio, but they were never released -- "Alligator Man" by Floyd Chance & Jimmy Newman and "Lie Down" by Peter. We have the acetate test pressings of those two recordings and we also have some reel-to-reel tapes from performances. We've assembled a CD's worth of classic PZEB live performances from those reel-to-reel tapes! 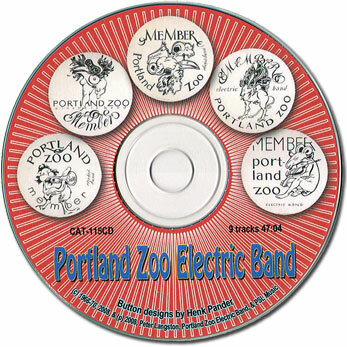 "CAT-115CD -- The Portland Zoo Electric Band, 'Purity - Accuracy'"
Don't forget to include your postal address! Want to wear something with our name on it?